I’ve recently had the privilege of doing some solid T&E with the pistol iteration of the Robar PolymAR-15, and I have to say that I’ve been pretty impressed by it. Freddie Blish and Robar designed it from the ground up to lighten the load that law enforcement officers have to carry (literally), and regardless of which version you shoot, the first thing you notice is how well they followed through on that goal of weight reduction. More impressive, though, is the overall balance of the weapon because of how well they thought out the remainder of the specs. The carbine-length gas system has a pretty smooth-feeling recoil impulse (considering the length of the barrel), and the 10.5″ 1:8 twist rate of the barrel stabilizes a wide range of bullet weights. The Bravo Company KMR9 forend is extremely light (only 3.8 ounces without hardware) because of its aluminum-magnesium alloy construction, which contributes to the overall balance of the pistol in a way that heavier rails just can’t do. 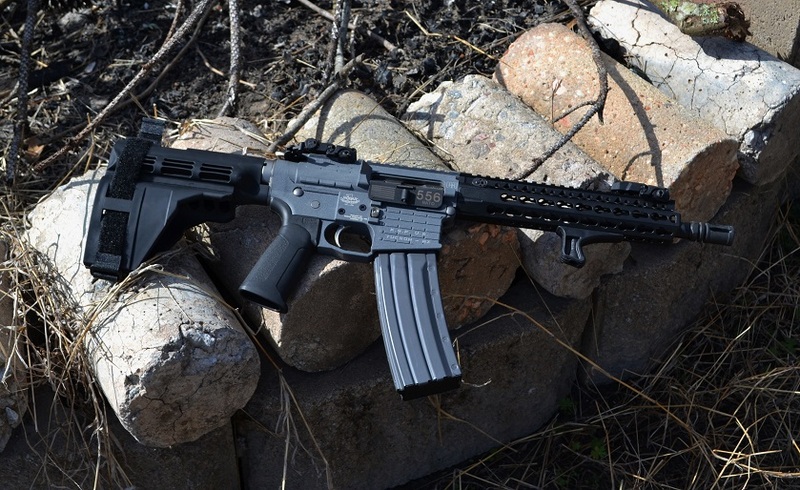 The Sig SB15 arm brace is more functional than a standard pistol buffer tube, but the shorter length of it compared to a carbine stock on a rifle makes it easier for the gun to feel front heavy with a clunkier rail. In that regard, the KMR9 was the perfect choice. The remainder of the specs are equally impressive, and this is an example of something being greater than just the sum of its parts (which are all pretty darn good in their own right). The interplay of the NP3 BCG and the polymer upper results in far less friction than with a standard BCG, and thus less heat transference. The BCMGUNFIGHTER ambi charging handle is one of the best on the market (the best, in my opinion). 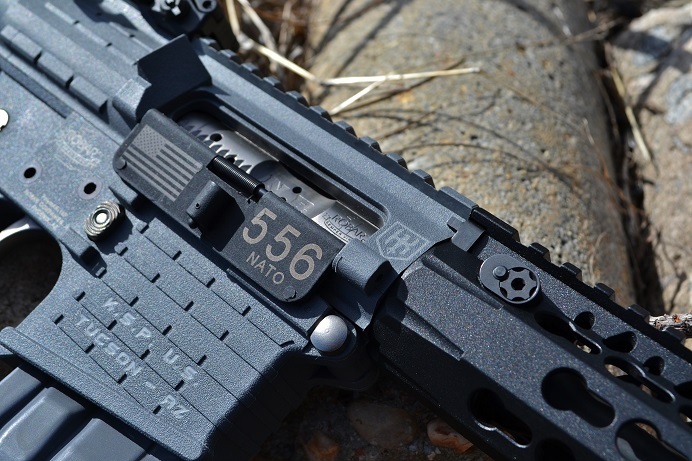 The upper/lower set is compatible with all mil-spec small parts, which means you can still install that aftermarket Wilson Combat or Geissele trigger without a hitch if you prefer. The trigger pull on this test gun measured in at just about 6.5 lbs and the NP3 smoothed it out a lot compared to other stock GI triggers. 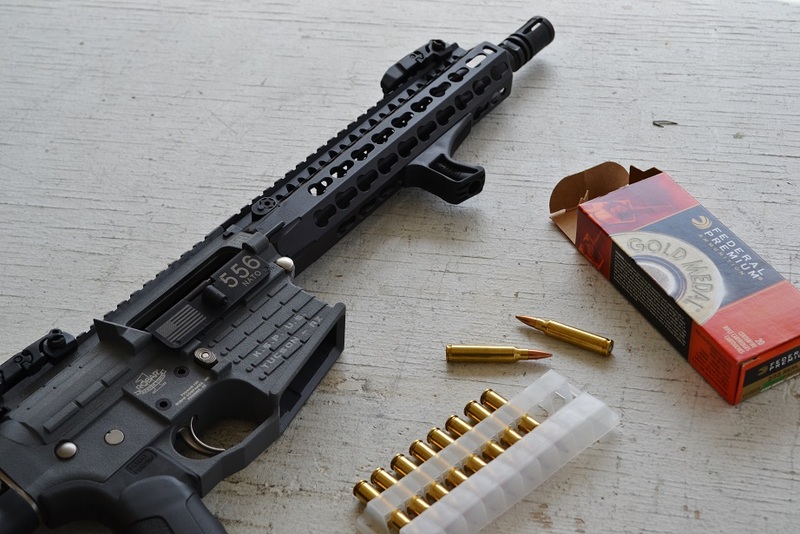 Still, if you plan to shoot it much you will probably find an aftermarket trigger preferable, particularly in the carbine or rifle because of the drastic difference a two-stage trigger can make in accuracy. Accuracy was good with Federal Gold Medal Match 69 grain .223 ammunition, but not all that much better than less expensive FMJ because we were just shooting it with the MBUS iron sights. Additionally, the 1:8 twist barrel should provide similar accuracy with a variety of different bullet weights, which was certainly my experience with everything from 55 to 77 grain ammunition. At 25 yards, groups with every round touching were the norm if the shooter did his part. Since it’s a pistol, I didn’t see the need to put an optic on it because the ranges I typically shoot pistols at are inside 50 yards anyway. The “P” model’s longer-barreled cousins come with guaranteed sub-MOA accuracy, though, so I am confident that with an optic or a 1–4 power the pistol would be capable of some impressive longer-range shooting as well. Overall, I give the PolymAR-15P high marks. It is accurate, light, and something different than what a lot of companies are putting out right now. From out-of-doors to out on patrol, this series of ARs is worth looking into if you’re someone who has to carry a lot of heavy gear around. Personally, I think I would derive more benefit from the carbine version, but that’s not a dig on the “P” model at all—I just shoot AR carbines more often than AR pistols. And for all of the .300 BLK fans out there, Robar also offers at least one of the models in .300, which would make for a quiet*, effective, and EXTREMELY light (sub-6 lb) shorter-range hunting carbine that could be plenty effective with the right bullet. 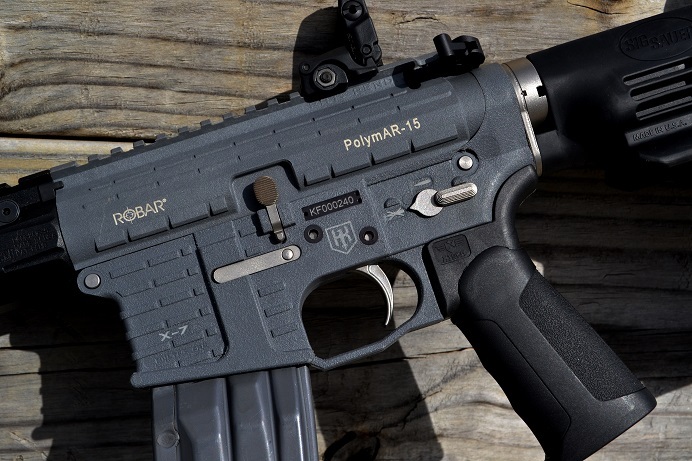 For more information, or to order your PolymAR-15 direct from Robar, check out all of the options at RobarGuns.com! And if you prefer a more conventional AR build, I’m sure that the staff at Robar would be more than happy to help you spec one of those out instead!